New York, NY – March 12, 2018 – Common Good, the nonpartisan reform coalition, today released its estimate of the cost of a one-year delay in construction of the Gateway Rail Tunnel Project under the Hudson River. This estimate builds upon Common Good’s landmark 2016 report “Billions for Red Tape,” which found that improved permitting for the Gateway Project could save taxpayers billions and avoid significant environmental harm. That report is credited with speeding up the approval process. Funding for the Project, which is vital to the economy of the Northeast, is being debated by the federal government. Below is the Common Good estimate. To speak with Common Good Chair Philip K. Howard, author of “Billions for Red Tape,” contact Emma McKinstry at 203-912-7174 or emckinstry@highimpactpartnering.com. The Gateway Rail Tunnel Project, which involves constructing new train tunnels under the Hudson River to connect New Jersey to Manhattan, is essential to avoid economic disruption in the Northeast Corridor. The two current tunnels are over a century old and perilously fragile; service outages are becoming increasingly common. The economy of the northeastern United States depends on the efficient movement of people both on the Northeast Corridor rail connection linking Boston to Washington, DC and between suburban New Jersey and Manhattan. As outlined in Common Good’s 2016 report “Billions for Red Tape,” delaying this project imposes enormous potential costs. In addition to rising construction prices, these costs include opportunity costs and the potential harm of a partial tunnel shutdown. The combined price tag for one year of delay in building the Gateway Rail Tunnel Project (also called the Hudson Tunnel Project) is estimated by Common Good to be $1.6 billion and 366,000 tons of CO2. According to the Gateway Program Development Corporation, each year of delay in building the tunnels escalates the project’s cost by 3.5 percent. The Hudson Tunnel Draft Environmental Impact Statement (DEIS) claims that the combined cost of building new tunnels under the Hudson and rehabilitating the existing tunnels is currently $12.9 billion. Construction stimulus benefits. The Hudson Tunnel DEIS estimates that the project would generate over 72,000 jobs in the region during the construction phase (for a total of nearly $6.4 billion in payroll), and nearly $18.7 billion in business activity during that same seven-year period. The DEIS also concluded that the construction phase of the project would generate around $380 million in federal, state, and local tax revenue. Economic benefits of increased rail capacity. In order to avoid a lengthier permitting process, the DEIS does not calculate the benefits of improved rail capacity on the local economy. However, a post-mortem report on the substantially similar “Accessing the Region’s Core” project (ARC) by the Government Accountability Office concluded that economic growth attendant to improved transportation infrastructure would generate $120 million a year in regional business activity over the long term, and that home prices in regions served by the project would increase by an average of 4.2 percent following the project’s completion, resulting in an additional $375 million a year for local governments from increased property tax revenue. Environmental benefits of increased rail capacity. The analysis for ARC estimated that increased capacity from additional tunnels would translate into 80,000 additional train trips and a 4.9 percent decrease in daily car trips across the Hudson, some 590,000 fewer miles driven per day. Based on the same metrics, the Hudson Tunnel Project would ultimately save over 1.1 million miles per day, reducing automobile traffic across the Hudson by nearly ten percent. The fragile state of the existing rail tunnels, which were damaged by Superstorm Sandy in 2012, represents a substantial economic and environmental risk to the region. Any shutdown before the new tunnels are completed will create gridlock throughout the region. Delay in construction increases that risk. Shutdown costs are a combination of a) lost productivity as commuters replace lost train trips with buses and cars and cause gridlock for all vehicular traffic throughout the region and b) environmental costs as commuters shift from efficient trains to polluting automobiles. Project officials estimate that further degradation of the two existing trans-Hudson rail tunnels will result, sooner rather than later, in a 75 percent decrease in capacity when one tunnel must be shut down for repairs, or a loss of over 131,000 train trips per day (65,500 each way). The closure for repairs is estimated to be for one year. Once repairs are complete for one tunnel, the other must be shut down for repairs. At the rate used in ARC’s permitting documents, shutting down one tunnel translates to nearly one million additional miles driven in the region per day. The three Hudson River automobile crossings already exceed capacity during rush hours. Here, we calculate the congestion effects using the generally accepted Balanced Transportation Analyzer traffic model, and conclude that one year of shutdown would result in $2.3 billion in lost productivity costs alone. We assume that the new tunnels could be completed in seven years, and that there is a 25 percent chance that one year of delay would cause a shutdown during the final year of construction that otherwise would not have occurred. Common Good (www.commongood.org) is a nonpartisan reform coalition that believes individual responsibility, not rote bureaucracy, must be the organizing principle of government. It presents proposals to radically simplify government and restore the ability of officials and citizens alike to use common sense in daily decisions. The Founder and Chair of Common Good is Philip K. Howard, a lawyer and author of The Rule of Nobody (W. W. Norton) and The Death of Common Sense (Random House), among other books. See Ted Mann and Paul Berger, “States Press for Tunnel Funds,” The Wall Street Journal, March 7, 2018. 2 Draft Environmental Impact Statement, Hudson Tunnel Project, Federal Railroad Administration and New Jersey Transit Corporation, available at: http://www.hudsontunnelproject.com/deis.html. 5 Because we cannot determine the net benefits of what the “Accessing the Region’s Core” project (ARC) analysis calls increases in “business activity,” here and below we discount that “business activity” estimates by 80 percent. 6 USA, Government Accountability Office, “Potential Impacts and Cost Estimates for the Canceled Hudson River Tunnels Project,” March 2012. 8 See, e.g., Philip K. Howard, “Billions for Red Tape: Focusing on the Approval Process for the Gateway Rail Tunnel Project,” Common Good, May 2016, available at: https://commongood.3cdn.net/e68919da002c4300cd_bzm6bxnb9.pdf. 9 Here we assume (for simplicity) that all benefits are enjoyed equally in each year of the seven projected years of construction, such that a delay of one year would effect one-seventh of the total benefits. We then discount that amount at a rate of three percent for seven years, the length of time between when that year of benefit could have been enjoyed versus when it actually was. 0 Here and for lost property tax revenue, we assume that these benefits would carry on in perpetuity, and therefore a delay of one year equals a total loss of that year’s potential benefit. 1 At a rate of 411 grams of emissions per mile driven. See USA, Environmental Protection Agency, “Greenhouse Gas Emissions from a Typical Passenger Vehicle,” May 2014. 2 See, e.g., Jim Dwyer, “Less Talk, More Action on Hudson Rail Tunnels, Before It’s Too Late,” The New York Times, May 18, 2016. 3 This is a conservative estimate. The DEIS suggests that a “worst case” scenario could disrupt over 200,000 trips per day. DEIS, supra note 2, at 1-7. 4 Here too, this estimate is conservative. At the time of the publication of “Billions for Red Tape,” Amtrak officials claimed that each tunnel would require one year of repair; however, recently they have begun to suggest that each tunnel will now require 18 months of repair. See, e.g., Elise Young and Demetrios Pogkas, “How Trump’s Hudson Tunnel Feud Threatens the National Economy,” Bloomberg, March 5, 2018. 5 As noted above, Amtrak estimates that tunnel repair work will take at least one year per tunnel. In this scenario we assume that, even if one tunnel fails, the other will remain serviceable until the new tunnels are completed in Spring 2026 (assuming a construction start date of Spring 2019 following one year of delay, and a seven-year construction timeline). Draft Environmental Impact Statement, Hudson Tunnel Project, Federal Railroad Administration and New Jersey Transit Corporation, available at: http://www.hudsontunnelproject.com/deis.html. Because we cannot determine the net benefits of what the “Accessing the Region’s Core” project (ARC) analysis calls increases in “business activity,” here and below we discount that “business activity” estimates by 80 percent. USA, Government Accountability Office, “Potential Impacts and Cost Estimates for the Canceled Hudson River Tunnels Project,” March 2012. 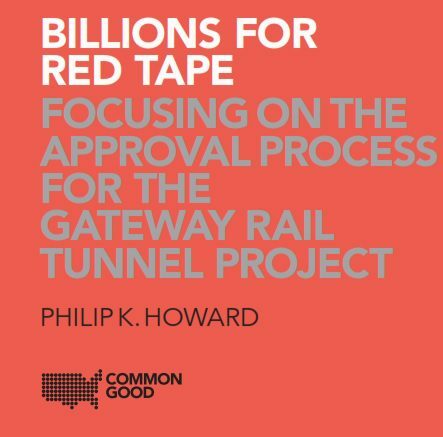 See, e.g., Philip K. Howard, “Billions for Red Tape: Focusing on the Approval Process for the Gateway Rail Tunnel Project,” Common Good, May 2016, available at: https://commongood.3cdn.net/e68919da002c4300cd_bzm6bxnb9.pdf. Here we assume (for simplicity) that all benefits are enjoyed equally in each year of the seven projected years of construction, such that a delay of one year would effect one-seventh of the total benefits. We then discount that amount at a rate of three percent for seven years, the length of time between when that year of benefit could have been enjoyed versus when it actually was. Here and for lost property tax revenue, we assume that these benefits would carry on in perpetuity, and therefore a delay of one year equals a total loss of that year’s potential benefit. At a rate of 411 grams of emissions per mile driven. See USA, Environmental Protection Agency, “Greenhouse Gas Emissions from a Typical Passenger Vehicle,” May 2014. See, e.g., Jim Dwyer, “Less Talk, More Action on Hudson Rail Tunnels, Before It’s Too Late,” The New York Times, May 18, 2016. This is a conservative estimate. The DEIS suggests that a “worst case” scenario could disrupt over 200,000 trips per day. DEIS, supra note 2, at 1-7. Here too, this estimate is conservative. At the time of the publication of “Billions for Red Tape,” Amtrak officials claimed that each tunnel would require one year of repair; however, recently they have begun to suggest that each tunnel will now require 18 months of repair. See, e.g., Elise Young and Demetrios Pogkas, “How Trump’s Hudson Tunnel Feud Threatens the National Economy,” Bloomberg, March 5, 2018. As noted above, Amtrak estimates that tunnel repair work will take at least one year per tunnel. In this scenario we assume that, even if one tunnel fails, the other will remain serviceable until the new tunnels are completed in Spring 2026 (assuming a construction start date of Spring 2019 following one year of delay, and a seven-year construction timeline).